Mom, the Intern: Time to get outside. Over the past two weekends, my church's leaders addressed members in a worldwide conference. This conference happens twice a year, beginning on the last Saturday in March and again on the last Saturday in September. Each speaker chooses his or her topic and gives a 5 - 10-minute speech about it. The messages are intended to inspire as well as provide direction. It seems each time General Conference rolls around, I have a new question to be answered. This time, all I could think about was my chronic pain, diagnosed years ago as the elusive fibromyalgia. It's like a little tag-a-long I can't shake. And for the past few months, it's been at its worst. My tried-and-true methods for quashing it just aren't working anymore and I'm exhausted. The truth is, it gets worse the more stressed I am. I have a lot on my mind with my mother's terminal cancer diagnosis, difficulties with my husband's job and now some health concerns with my toddler, Clara. This unexplained, all-consuming pain has been a part of my life for nearly five years now. Since there's always something to be stressed out about, it hasn't gone away -- it has simply ebbed and flowed, getting better or worse but never leaving me entirely. I remain hopeless and depressed. I wake up each day in pain, but life must go on. My children need my help getting ready for school, so I roll out at 6:00 every weekday morning. Dill helps however he can, but he has to go to work, so the morning routine falls mostly on my (sore) shoulders. After the older kids go to school, I have a toddler to love and teach, a beautiful home to maintain and a handful of music students who come over for lessons most afternoons. And when my big kids get home, they need a loving parent to ask them about their day, help them with homework and take them to the park to let off some steam. I also cook dinner most nights. By the time Dill gets home, I'm running on empty and my muscles and joints are screaming at me. Nighttime is the hardest because I know that when I wake up, it will still be there, staring me in the face. That stupid little companion, my pain. My life is truly lovely, one to be envied -- a handsome, adoring and hard-working husband, three smart, beautiful kids, the perfect home and even a little job that brings in some extra income. But sometimes, my pain is so bad, it's literally all I can think about. How can I feel joy when all I feel is this blinding pain? As the conference started last weekend with the Women's Meeting, I silently plead with God to know how to cope with this trial and others. How can I live happily and gratefully in spite of it all? That meeting was focused on refugees all over the world who are in great need of material goods as well as love and friendship in general. I was surprised and so happy to see my church take a stand of acceptance and love towards the refugees, despite the many politicians and thought leaders who loudly preach otherwise. The choir who provided the music at the meeting was filled with refugee women and girls, who sang of God and Jesus Christ with such conviction. As I watched and listened to the many talks about these refugees and their plight, I thought, My trial isn't so bad. At least I have a warm home where I can suffer in some comfort. At least I live in a land where I am wanted and don't have to hide. At least my family is all here to support me instead of stranded in a war-torn country or dead in the sea somewhere. Then, two days ago, the general meeting for all church members began. Again, I was approaching it from a "please help ME" standpoint, hoping for some comfort. 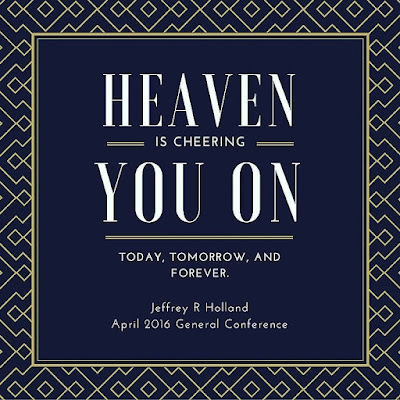 And I did receive some -- for instance, Jeffrey R. Holland reminded us that "heaven is cheering you on today, tomorrow and forever." Many other leaders spoke of God's love for us. Others talked about the Resurrection and how someday, all of us will be free from whatever ailments cause us to suffer -- chronic pain, cancer, addiction, grief, all of it. This theme kept repeating, from admonitions to forgive others and let go of your pride to yet another address regarding the refugee crisis. There were also talks about harmony in the family, about apologizing and setting aside your pride. There were others which plainly stated why opposition is important in life and how it helps us become closer to God. It was as if the whole conference was written for me. "Allow yourself to feel joy in all the small moments." This one is hard for me as I am very empathetic. I take on the world's problems, which is why I am also very stressed out most of the time! Being very empathetic often prevents me from being happy because I feel like if someone I care about is suffering, then so must I. My empathy knows no boundaries which is unhealthy. I need to learn to better balance my empathy with my own personal emotions and find room for both. "Accept your pain and learn from it instead of trying to fix it." I am the type of person who is always trying to fix things. As such, I spent the better part of the last five years trying to find a solution to my daily pain. Well, after so many failed attempts, I had lost all hope. The loss of hope feeds depression and anxiety which are both obstacles for living happily. Instead of pining for a fix, I need to accept the reality of this trial and focus on what it is teaching me. I can (and should) accept the advice of others and try different methods to alleviate the pain, but I should also try to find purpose in my "constant companion," pain. "Focus on others and your pain won't be so consuming." When you're suffering, it is very difficult to see outside yourself. All you see is YOUR pain, the injustice of YOUR situation and YOUR overwhelming sorrow. You feel it all so acutely, it blinds you to the challenges of others. But the truth is, we are all in pain, in one way or another. I know I need to do more for other people as it will help me be more grateful for my life and will give me a greater perspective. I am also looking forward to learning more about the Church's new refugee assistance program, "I Was A Stranger." I know this is getting long, but I need to clarify one more thing. If I feel depressed, it is because I am in pain every day of my life and there is no foreseeable end to it. It is really that simple. It is not because I married young, nor because I have small children, and it's definitely not because I actively participate in the LDS church. My husband, my children and my faith are the three things I can count on to get me through every rough patch! They are the source of my joyful moments in life, not the cause of my suffering. Yes, I have desires to pursue endeavors outside of my home in the future, but that doesn't mean I'm currently some miserable mom wishing the days away. I cherish the one-on-one time I have with my sweet daughter, Clara and know these moments will pass too quickly. And quite frankly, I also like being able to blog in my pajamas. Everyone has their challenges in life. I am choosing to be more open about mine in hopes that the people I love will empathize, try to help or at least understand where I am coming from. I will always afford the same courtesy to you! Today, I resolve to get outside of myself. I know I still need time to meditate and care for me, but that time will not involve self-pity or feelings of hopelessness. I will appreciate the happy moments of daily life and know that as I do, I will see them more abundantly. I am accepting chronic pain as "my trial" and want to approach it differently than I have for the past five years. I want to accept it and learn from it, not try to fix it to no avail. Here's to getting outside more often. Cheers. Katie -- Thanks! You are the second person today to tell me about a person who completely revitalized their life by changing their diet. I will check it out. Thank you so much. Hi! I found your blog because of your very sensible post about Maya Angelou being misquoted. Maybe Rosalee de la Foret's talk about fibromyalgia might have something useful in it? http://www.herbmentor.com/fibromyalgia/ Best wishes to you! I'm new to your blog, but let me tell ya....we are way too similar. I was diagnosed at 19 with fibro and have had it for 11 years (although I think I've had it my entire life). I've read about 4 posts so far and it's as if I wrote them myself!